Hey folks… Back from Chihuahua and madly transcribing and putting together some of the stories from my trip. Meantime, here’s a short update regarding the Rarámuri people and the recent appearance of four of their leaders at the IAHRC in Washington, DC, published by Upside Down World. Also, I did a longer blog post that sheds a little light on post-war mongering in Ciudad Juárez. URIQUE, CHIHUAHUA – Cold air cuts through the meeting hall, drafting in through a gap between the corrugated roof and the adobe walls. Women sit on one side of the room in sandals or vintage Nike runners and long skirts, their heads covered by kerchiefs. On the other side sit the men, in slacks and shirts and vests. Children kick around a soccer ball outside, and from the kitchen wafts the smell of chili and beans. This gathering, held in Bakajípare, deep in the highlands of Mexico’s Sierra Madre mountain range, was a strategy session for an upcoming meeting between members of Rarámuri (Tarahumara) communities and the state government of Chihuahua. The encroachment of tourism projects, the difficulty of accessing health services, problems in schools and with waste management dominated the discussion, which was sometimes in Spanish but mostly in Rarámuri. Four representatives from Rarámuri communities have made the long trip from their remote communities to Washington, DC, to appear before the Inter-American Human Rights Commission, where they will appear today at 5pm. This is the first hearing ever granted to the Rarámuri. It is expected the four representatives, who are backed by 41 Indigenous governors, will testify about logging, tourism, and other issues impacting their communities. Over the past six years, the Sierra Madre has become one of the most dangerous regions in Mexico. Vicious acts of violence against civilians erupt with stunning regularity. Thirteen people, including a baby, were massacred in September, 2008 in the nearby tourist town of Creel. Eighteen months later, another massacre – this one caught on video – among whose victims was a 14-year-old girl. Four teachers on their way to a funeral in the mountain town of Guachochi were pulled from their car, tortured and murdered after passing through a checkpoint believed to have been run by a criminal group. Repeated complaints to authorities about the checkpoint were ignored. This year started with a headline in La Jornada that screamed “Attacks and siege of populations leave 14 dead in Chihuahua.” In February, the Bishop of the Sierra Tarahumara said narcotraffickers control the mountain range. Particularly hard hit has been the tourist economy linked to El Chepe, a passenger train that carries visitors from Chihuahua City to the Pacific coast, passing through a mountain range where the landscape is often compared to that of Arizona’s Grand Canyon. The train used to pass through communities like Divisadero four times a day, now it only passes once. “These days there’s no sales at the train, we want two trains a day from Chihuahua and another two from Mochis,” said Miguel Cruz Moreno, a Rarámuri governor from Mogótavo, Chihuahua. Selling crafts and instruments to tourists has become a mainstay for Rarámuri men and women who live along the train’s route in otherwise isolated parts of the mountain range. Community members are not the only ones banking on the economic opportunities linked to increased passenger train traffic through their villages. A number of tourism-oriented mega projects are in the works, whose proposals depend on a rebound in the number of travelers. But these proposals come at the expense of the Rarámuri communities nearby. Arriving in Divisadero today, visitors are confronted by a mini-golf course on the edge of a cliff overlooking a dramatic canyon, as well as an imposing, chain link fence separating the road from the scenic overlook at the cliff’s edge. These are the latest developments brought through a series of land deals linked to the Fideicomiso Barrancas del Cobre. Opponents say these deals are illegal and damaging to the Rarámuri people. “The investors don’t respect the people, they should ask the community and the authority… if the community doesn’t want it, it shouldn’t happen,” said Cruz Moreno. His community was never consulted before construction started. A lawsuit against the state-run Fideicomiso Barrancas del Cobre led to a Supreme Court ruling in March 2012 which obliged the organization to consult with local communities regarding major tourism projects and land sales. “The first thing to do is to ask the community,” emphasized Cruz Moreno, indicating that even since the ruling there has not been adequate communication between developers and Indigenous people. The Fideicomiso started construction work in the Sierra in 1996, building all kinds of tourist infrastructure including ziplines and a new train station. Their proposed developments in Divisadero threaten to displace longtime artisans and vendors. 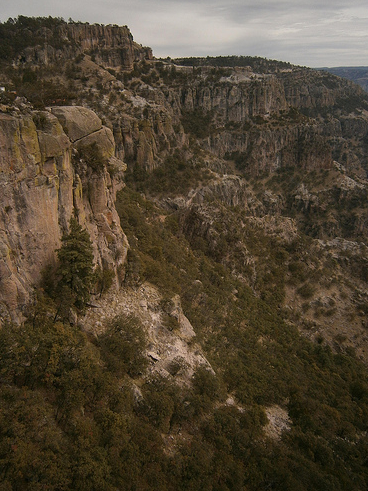 Even though the Fideicomiso was ostensibly created to bring economic benefits to the Rarámuri people, “not one cent has gone towards improving the lives of the Rarámuri communities in the cliffs: they lack clean drinking water, all kinds of services, and medical attention,” according to local columnist Victor Quintana. Four of the communities to testify before the IAHRC today lack recognition of their traditional lands. In legal terms defended by the State, they do not exist. They lack many basic services. Those far from tourism pressures are threatened by logging and land fraud, isolated but not defeated by the omnipresence of fear in the region. Today’s hearings in Washington open up a new space for the Rarámuri to air their concerns and seek meaningful consultation as they strive to protect their economies and their land from further enclosure and encroachment. The proceedings will be broadcast live here. A recording of the proceedings will be made available later here. Dawn Paley is a journalist and editor member with the Media Co-op. Her work is online at dawnpaley.ca and you can follow her on Twitter at dawn_.